This fact-filled, colorful look at the amazing world of birds includes a call to action to protect these beautiful creatures. In this simple introduction to birds and ecology, Melissa Stewart describes the behavior and beauty of birds and describes specific ways people can help protect them and their natural habitats. Children learn basic facts about birds, including where they live, what they eat, and how they benefit plants and other animals. Sidebars throughout the book contain information on human action that has harmed birds and the many ways people can protect certain bird populations, such as by preserving forests and meadows and cutting down on pesticide use. Pointers on how youngsters can help birds in their own neighborhood are also included. 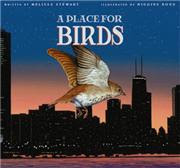 Author Melissa Stewart offers children a glimpse into the interconnectedness of our world and shows how the actions of one species can inadvertently harm another. Illustrator Higgins Bond’s colorful, realistically detailed illustrations highlight the diversity of the species—from the crested honeycreeper of Hawaii to the Florida scrub jay. Future titles in the series include A PLACE FOR FROGS (Spring 2010) and A PLACE FOR FISH (Spring 2011).